It has been a few days now since the big showcase that revealed to the world the next supersized smartphone from South Korean manufacturer Samsung, and now as the release date nears the official UK unlocked pricing for the Galaxy Note 3 has been revealed but is rather high. Samsung revealed its new phablet device a few days ago along with the wearable Galaxy Gear, and now the company has begun pre-orders for the two devices for UK customers. The Samsung Galaxy Note 3 is priced at a massive Â£649 from the official Samsung website, while the Galaxy Gear can be had for Â£299. The company will sell you both devices together for Â£848 that will save customers Â£100, but these prices are quite high when compared to the figures that have already been seen in the US. Verizon Wireless will sell you the device for $699 while AT&T has it listed for $724, but it has to be remembered that this UK price from Samsung is for an unbranded SIM free version of the Galaxy Note 3. There is also a special deal on offer for the first 500 customers who pre-order both devices together in the form of a Â£50 discount at the flagship Samsung Experience Store at the Westfield shopping mall in Stratford, London. This is on condition of trading in an old device that can actually be in any condition and doesn’t even have to work. The Samsung Galaxy Note 3 is up for a cheaper price though at online retailer Expansys who will sell you the smartphone for Â£599.99, while rival retailer Clove doesn’t at the time of writing have any pricing details for the device. Carphone Warehouse has the device listed in its coming soon section and will be available free on contracts starting at Â£47 per month, but as we get closer to September 25th more pricing details for various carriers and retailers will be revealed. So now the dollar to sterling exchange rate is unity? Jesus Samsung, get a grip and stop ripping us off in the Uk. everthing is like that. they get things cheaper in usa because of various reasons..(income,taxes……) an I pad cost less in usa f.example…. 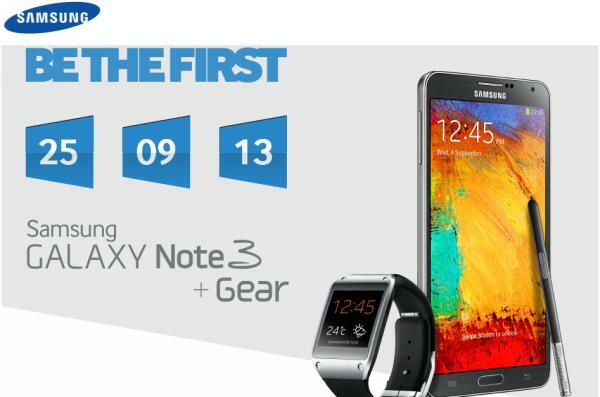 I want the NOTE 3 for FREE with no upfront costs on a maximum of Â£40 per month contract over 24mths on THREE. If the GALAXY GEAR watch does retail for Â£299 then in my opinion it is way too much. I think that it should be a maximum of Â£150 but If you’ve already bought the NOTE 3 then it should be no more than Â£125. way too high, in the usa the conversion price is bout Â£450 offline with verizon, luckily i go in November so will buy there, plus I bet there will be no 64gb, they make it up…..!! just wait, yes, dont follow like sheep, we are the bosses as it’s our cash they want, so make them sweat like they make us sweat for new handsets and demand bigger memory 64GB minimum….! and no more bloatware!